6.3 cu.ft. 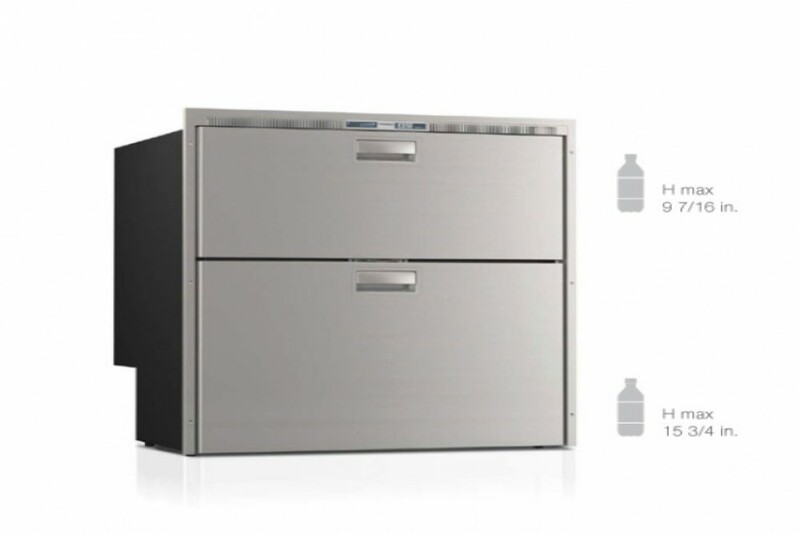 Top Drawer Freezer, Bottom Drawer Refrigerator, Stainless Steel Front, Internal Condensing Unit, Surface Flange, 12/24v -115VAC DRAWER REFRIGERATORS AND FREEZERS Designed to transform the drawer refrigerator into a stylish piece of furniture, they express a sober and sophisticated, able to interpret the unique personality of your boat. Available in confgurations ranging from generous 10.6 Cu.Ft up to the smallest of only 1.2 Cu.Ft, and with the possibility of having a refrigerator functions, freezer and icemaker, with built-in or remote cooling unit. They are really pleased to satisfy any kind of need and location on board. The special care in the choice of finishes of stainless steel - AISI 316 - make the product aesthetically pleasing, and can be integrated in any type of boat interior. Now with the new Steelock system.